If you are a literature groupie you might enjoy this list. It's my top 10 places - obviously highly subjective - where you can soak up the atmosphere of a particular writer or a certain milieu. Rather conventionally I'm giving you my list in reverse order and keen observers may note that there's actually 15 discrete locations but then math was never my strong suit. 10. 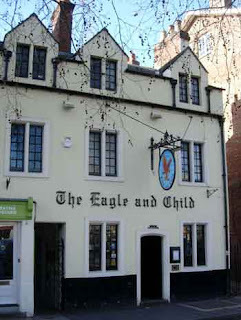 The Eagle and Child Pub, Oxford, England. The bar where JRR Tolkien and CS Lewis used to go to read out loud their works in progress and get criticism and advice from their peers. Large chunks of The Lord of the Rings and the Narnia books were composed here. They serve real ale and Philip Pullman and even Alan Moore have been known to pop in. Consequently it's a kind of a nerd paradise and it's where I met that lucky lass the future mother of my children. Ok the whole thing's fake, the furniture isn't period and no one knows exactly what his apartment really looked like, but it is as close as we're going to get to the real McCoyski. When I was there they had a free walking tour map where you could follow Raskolnikov and other characters' routes through the city and that's a great thing to do as long as you don't kill an old lady at the end of it. Since we're in Petersburg we might as well stay here. Pushkin wrote a poem about a young man who threw his life away on a pointless duel in the forest. Rather tragically he then, er, threw his life away on a pointless duel in the forest. There's a statue marking the spot which was hard to find but worth it: when I went to see it there was a beautiful blonde girl in a white dress leaving flowers for Pushkin and weeping for him as if she'd just heard the news. No, unfortunately, she wasn't the good kind of crazy. Kerouac, Ginsberg, Cassady and William Burroughs used to go to Ginsberg's room in the Colburn to take acid, mescaline and other pharmaceuticals and watch the sun set setting behind the Front Range Mountains. I've never enhanced my experience in such a way but the sun sets are nice. 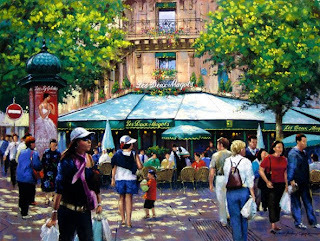 This cafe was the centre of the literary universe for periods in the twenties and again in the fifties. Who mooched cafe au laits and wrote here? Who didn't? Its patrons included: Scott Fitzgerald, Joyce, Dos Passos, Djuna Barnes, Sartre, Camus, de Beauvoir, Beckett and many others. I mean ok so it's an expensive tourist trap these days but you still have to go here once in your life if only to experience the rudest wait staff in the Western World. This is where Karl Marx wrote Das Kapital and where anybody who was anybody in British letters did their research and writing. Dickens, Trollope, Thackeray, Auden, Orwell, Waugh, Maugham, Amis etc. all used the RRR at some point. Now that the British library has moved to St Pancras anyone is allowed in to visit the RRR and if you go there early before the hordes of screaming children it can be quite pleasant. This atmospheric joint is where Hemingway wrote For Whom The Bell Tolls. Be warned the current pianist has an inexplicable fondness for Celine Dion. Final resting place for Hawthorne, Emerson, Alcott and Thoreau and a short hike from Walden Pond State Park where you can visit a reconstruction of Thoreau's cabin. There are many great literary cemeteries in the world (Westminster Abbey and Highgate in London; Montmartre, Montparnasse and Pere Lachaise in Paris; the lovely Novodevichy Convent & Cemetery in Moscow) but this is a very special place. For me it's the epitomy of tranquil, quiet, autumnal loveliness and I wouldn't mind spending all eternity here myself (but not for a while yet). After the somewhat dull symmetries and broken fountains of the Alhambra why not walk down the hill to the home of Spain's greatest twentieth century poet. You won't be disappointed. When I visited there was someone actually living here but he was kind enough to let me in anyway. Since this is also technically Sam Spade's apartment too it can be a big thrill for fans of The Maltese Falcon. I haven't actually been here but it's very high on my to do list. Mark Twain visited and was impressed and if I remember correctly Paul Theroux dropped by too. Anyway it looks charming and I'd like to go. Ok neither of them are really writers (though Trot had a nice turn of phrase) but these houses are definitely worth a visit. They're very close to one another in the pretty Coyacan section of Mexico City which was actually a port in the time of stout Cortez. (Mind boggling). Trotsky's house was and is like a fortress and he's buried in the front garden. Frida Kahlo's home is one of the most beautiful interior spaces I've ever been in. She turned the house into a full blown extension of her personality and her art blossoms in every corner. It's quite the scene. If you want to read about my odd adventure in the Finca Vigia then click this link to The Times.